The Gasket Box line is the ideal storage solution for keepsakes, photographs, important documents, linens, and other items that need to be stored away and protected. Gasket Boxes offer a gasketed seal to safeguard items from both air and moisture, keeping those special belongings safe from the elements, dust and pests. 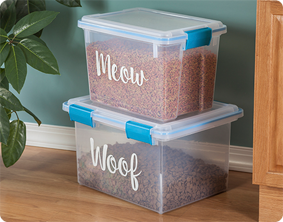 Durable, tight-fitting latches keep the lid secured to the base, and the clear lid and base allow contents to be easily identified, without opening the lid. 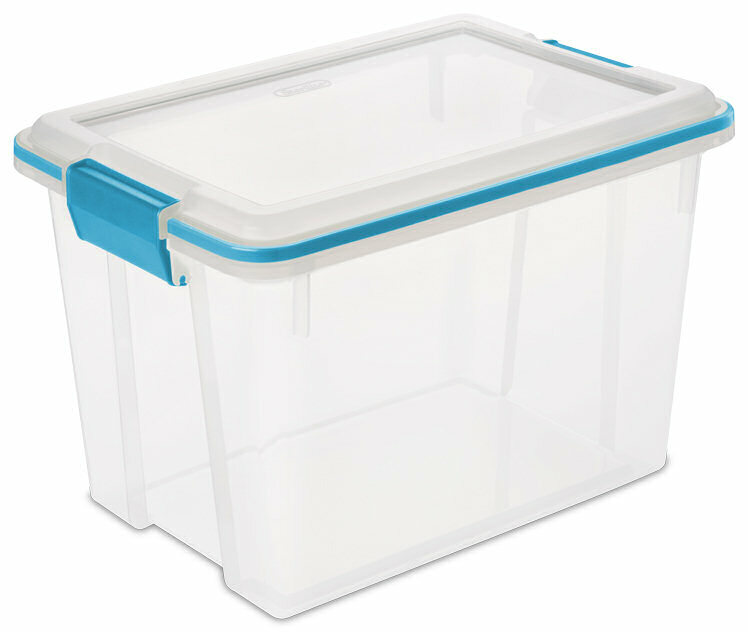 The 20 Quart Gasket Box is ideal for organizing school projects, paperwork and photographs that need to be protected. The gasketed seal also helps to keep pet food and other bulk foods fresh longer. The Gasket Box line has six sizes, ranging from 12 Qt to 80 Qt, providing a variety of storage options for those items that need to be kept safe as well as for longer term storage needs. The 12 Qt and 20 Qt Gasket Boxes use the same lid, allowing both the shallow and deep sizes to be stacked in same footprint. The overall assembled dimensions for this item are 16 1/8" x 11 1/4" x 10 7/8". Overall Assembled Size: 16 1/8" x 11 1/4" x 10 7/8"
The gasketed seal helps to keep pet food and other bulk foods fresher, longer. 20 Quart Gasket Box is rated 5.0 out of 5 by 14. Rated 5 out of 5 by JLC52 from Outstanding Gasket Performance When I started expanding my collection of highly-volatile essential oils (and blending supplies), I needed a convenient tote to house it all. I happened to have an empty gasket box on hand, so it was recruited for what I thought would be a temporary job. Now I know I'll never use anything but a gasket box, which is able to seal in all the various aromas and also undoubtedly prolongs the shelf life of the collection. Rated 5 out of 5 by IamChellester from 20 Quart Gasket Box I have always loved Sterilite products, but sometimes think they just get better each year I buy more! I recently wanted to store some items in my garage, but worried about moisture. I then found these great totes that help to protect against air & moisture. They have worked perfectly for me! I was able to store all the items into a few boxes & I love how they are clear so I can see what I have, and the latches that snap down work great at holding them shut! I would highly recommend these awesome totes! Rated 5 out of 5 by PA Consumer from Great, sturdy product! I have all three sizes of the gasket boxes made by Sterilite, and I believe that they are all a great value! This 20-quart box is ideal for smaller, delicate items like Christmas ornaments or any items that need to be protected with a sturdy seal. During our recent move, these Sterilite boxes survived the trip like champions! I am extremely pleased with Sterilite gasket boxes, and Sterilite products in general! Rated 5 out of 5 by brownea7 from Make moving easy! Over my past four years as a 1st grade teacher I have had to switch classrooms each year!!! The amount of books, supplies, records, etc. that need to be saved and stored each year is insane. I am so happy that I had this product to keep all of my items protected and neatly stored not only during the summer, but as I moved my belongings from room to room and from school to home and back again. Not only did this product keep my items safe, but it also made transporting super convenient and manageable. Rated 5 out of 5 by kennedha from Amazing for yarn storage! 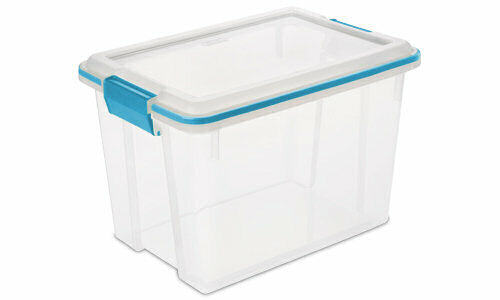 I have purchased several of these boxes to store my yarn. Not only is the size ideal for that, I am glad knowing that the seal won't let pests in! I've had mine for a few years now and they're still in great condition. I highly recommend them to all my knitter and crocheter friends! Rated 5 out of 5 by Jenni M from Great product We recently got a puppy and needed something to store dog food in. I purchased one of these and it has been great. My puppy can't get into it and I can't smell dog food in my kitchen because of the strong seal. Rated 5 out of 5 by momtotwo24 from Best storage box EVER! I bought these a few years back and they are the best storage containers I have ever purchased! My boys are hard on containers, and most end up cracking or breaking. But we have used these for their Legos for years and none of them have broken--even with hard daily use and abuse. The seals are great for keeping moisture out, they are easy to carry, the handles keep the lid tight. You can hold the container upside down full of Legos and they won't come out. Thank you, Sterilite, for making a high quality product like this! Rated 5 out of 5 by Sunshine7304 from Air Tight! I really like this product because the gasket seals the box tightly. I dislike opening a box after it has been in storage and having it smell musty or like gasoline (from being in the outdoor shed), so this product is a great solution to that problem. It's also clear so you can see what is inside without having to open it, and it is a good size. It holds enough without being overly heavy.